« As World War II came to a close in 1945, a small American tank battalion discovered a train full of Jewish prisoners abandoned in the German countryside. The American soldiers did not understand what was going on. The explanation was waiting for them within the wagons that were waiting there silently. 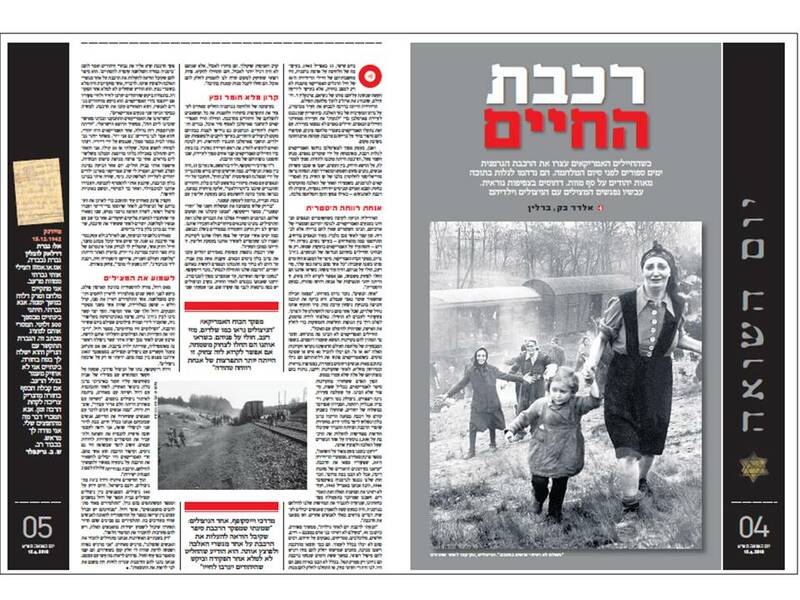 This story ran in the major Israeli daily “Yediot Aharonot”on Holocaust Remembrance Day, April 12th, to a quarter million households. Thanks to the author for his interest and to Varda W. for contacting him. This story ran in the major Israeli daily “Yediot Aharonot”on Holocaust Remembrance Day, April 12th, to a quarter million households. On Friday, April 13 1945, at the midst of war on the grounds of Germany, the thoughts of the 30th Division of American soldiers were concerned not only with the situation in the frontier, but rather a the message on the death of their president Franklin Roosevelt who had led the USA in the world war. The division was on its way to conquer the city Magdeburg, on the western side of the river Elba. A limited artillery troop entered the village of Farsleben, in order to “clean it up” from the last Nazi soldiers. No Nazi soldiers were found there. However, the American soldiers came across prisoners of war from Finland who told them a strange story, namely that they had escaped from a train loaded with people, nearby. Indeed, in a valley near Farsleben, the Americans were astonished to notice a train guarded by Nazi guards. The locomotive was still active, the train being ready to move. Nearby the railway, on the green loan among the trees, there were several people sitting or lying down – enjoying the sunshine and the fresh air. The view was absolutely surrealistic: in the midst of frontier between the Americans and the Germans, where on one side of the Elba River the Red Army Forces were approaching driving Nazi troops, a train was taking a rest – as if time and war have stopped moving. The idyll terminated when the Nazi guards noticed the American tanks. In view of the size of their enemy, these guards realized that they had no chance and that should rather escape. They were captured after a short while. While the Nazis were still escaping, there were a few civilians, mainly women, girls and children, who approached the Americans with joyful screaming. Only then did the Americans realize the horrible appearance of the train passengers. George C. Gross, the commander of the American Force, reported last year – just before his death, on that meeting: “Each one of them looked like a skeleton, reflecting the signs of starvation and morbidity on their face. Moreover, when they saw us they burst into laughter of joy, if one can indeed name it ‘laugh’. It was a burst of pure sigh of relief, almost hysterical”. “One of the women”, Gross remembered witnessing, “found a package that a Nazi had left while escaping. She checked the package and waved in victory movement with the food kit. She was immediately surrounded by a shoal of skeletons, each one of them trying to dominate the ‘prize’. My shouting at them did not help. I had to leave the tank, to pave my way among the weak, erased bodies, in order to save that woman, who quickly escaped with food”. The American soldiers did not understand what was going on. The explanation was waiting for them within the wagons that were staying there silently. In the language of the First World War these wagons (“boxcars”) were designated “40 or 8”, namely, they could accommodate 40 people or 8 horses. When the Americans opened the doors they found inside hundreds of people loaded, standing, stinking horribly. After having evacuated the train, there were the remaining bodies of those who did not manage to survive following that journey. The many people who were released from the train told the Americans, in a mix of languages, a story that was impossible to understand. Eventually, a young woman, Gina Rappaport, a fluently English speaking survivor from the Warsaw Ghetto, told them that this was an exportation of Jews, loaded on the train a week earlier at the concentration camp of Bergen Belsen, on the way to an unknown destination. Investigating the guards of the train and the personnel, it appeared that they had received clear-cut orders to lead the train with its 2,500 passengers – to one of the bridges on the Elbe River, and to explode it there. “At that time we knew very little about the holocaust”, says Frank W. Towers, one of the commanders of the 30th division, whose soldiers found the train. “We have read in the newspapers descriptions of concentration camps, but we did not realize what it was all about. Our forces entered Germany on October 1944,and here we were on April 1945, and so far had not seen those camps and the prisoners. We thought that it was all just propaganda, to enhance our determination to fight Germany. It was hard to believe that people can carry out such horrible things to other people. We then found the train”. Towers nowadays 93 year old, continues, “I arrived at the train on the following day after it was found, I have never seen people in such conditions – skinny, weak, filthy, stinking, fighting for their life. Many of them could not even stand up. They have already been taken out of the train, sitting around it, anticipating food and medical treatment. During the six days on the train all they have received was tasteless soup. We could not understand the situation in which they were. We had plenty of food, so we provided them our war-servings of food and chocolates. They ate immediately, but their bodies were not used to food anymore, and they started vomiting. The medical personnel called in emergence instructed us to stop serving the food, and the recommended treatment was to provide the food in by far smaller amounts”. At the midst of the war against Germany, Towers decided to stop the progression of his fighting forces and to direct all the resources towards rescuing the Jews who were in the train. Firstly, the Americans asked the inhabitants of Farsleben to collect food, clothes and medications for the Jews. The Germans were also requested to accommodate survivor Jews in their homes, particularly elderly and families with children. The Farsleben inhabitants objected to these instructions, and complied only upon the threat that unless they obey – the Mayor of the village will be killed. At the same time, the American soldiers prepared a collective grave near the small town, to burry all the dead victims of the train. Dr. Mordechai Weisskopf, then – a 15 year old boy born in Budapest, was among the survivors. A few months earlier he was deported from Hungary by the “Arrow Cross” fascist party, and then transferred by Nazis to Bergen Belsen, along with hundreds of Budapest Jews. The Hungarian Jews were placed in “zunderlager”, a special site at the camp, probably as based on the intention to use them in an exchange arrangement with the Allies, similarly to the arrangement that went on with Kastner. “It was all about at the time when the second transport of ‘Kastner’s Jews’” was moved out”, saysWeisskopf. “We were transferred to their place. The Germans allowed us to keep our clothes and personal back-packs. We had the privilege of special conditions, and exempted from the slavery. We suffered from hunger and the torture of standing up in orders in the snow and rain. A few days after the end of Passover we were transferred to a train, claiming that we would be released upon an exchange arrangement. Obviously, this was misleading”. Two additional trains loaded with Jew prisoners left Bergen Belsen on the following days. One of them disappeared, leaving no traces. Until now, it is not clear what the Nazis intended to do with those Jews. “Our train started moving”, recalls Weisskopf. “We were moving back and forth, until we stopped near Magdeburg. We knew that we were entering the area of the frontier. The survivors had several different versions on what was happening there. I heard that the commander of the train called the representatives of the Jews and told them ‘Germany is lost and the war is about its end’. He told them that he got an order to move the train onto one of the Elba bridges and there to explode it. As he said, one of the wagons was full of explosives. He said that he had decided not to carry out that order, pending on an agreement that the Jews will guarantee his life as well as his soldiers, in case they are captured by the Americans. He asked the Jews to provide him with their civil clothes for himself and his soldiers, and they all left the train. The Americans arrived there on the following morning day, in two tanks”. “When we saw the Americans we all hugged and cried in joy, happy to have survived and be acquitted that day”, continues the Israeli doctor. “There was the great excitement. One of the Americans was a Jew, and said in Jewish: ‘I am also a Jew”. Later on I entered a house in a nearby village that had been evacuated of its inhabitants. We went straight into the pantry, looking for food. My body weight at that time was 30 Kg. I, as well as the others, started eating with no control, and then suffered from severe diarrheas. Afterwards there was a burst of typhus epidemics. I was hospitalized. One day, a Red Cross representative came in, telling me that an American Rabbi was organizing a group of Jewish children to migrate to Palestine. My brother in-law, being with me in Bergen Belsen and in the train, convinced me to join that group. We were transferred to Buchenwald, from there to Marseille, and then to boats on the way to Haifa”. after they were first sprayed with DDT and received medical treatment, and were then transferred to an abandoned German Airport, where they stayed until they were moved to refugee camps. Subsequently, he returned with his people to resume their role in the war. Two days after having rescued the survivors from the train, the British soldiers released also the Bergen Belsen camp. Towers fought until the victory, returned to the USA and has never engage in the story of the train ever since, for the whole period of 62 years. Then, one day he received a letter from a friend, another veteran soldier, who suggested viewing an internet site of a high school in New York. The name was: ”The second world war, a living history project, a train near Magdeburg”. “It sounds familiar”, Towers responded laughing. Matt Rozell, a history teacher at the Hudson Falls High school, asked his students nine years ago, to interview war soldier veterans. One of the students interviewed his grandfather, Carrol Walsh-a judge in Florida, who happened to be one of the two commanders of the American tank. Rozell was move on with that story. The witness referred the teacher to George C. Gross in California, a university lecturer at that time, who delivered to the teacher photographs that he had made on the day when the train was released. “The photographs were amazing”, Rozell says. “I organized the witnessing data along with the photographs and placed them all on the internet site. Four years later, I had the first call from one of the train survivors, in Australia, who was a child on the train. Slowly, the circle of connections with survivors and rescuers has expanded. A meeting of these people was organized on September 2007. At that time I knew about only four of them”. VardaWeisskopf, the daughter of Mordechai Weisskopf, learned about the renewing contact with the rescuers of her father while she was searching material about him in the archives of Bergen Belsen. Recently, in January, following correspondence with Rozell and talks with Towers, she took it to locate additional survivors. “Talking with Towers was a mighty shock to me”, says Varda. “How many people are privileged to talk with people who have released their parents, people who thanks to them we live? As a second generation daughter to holocaust survivor, I have the feeling of a personal mission to record the information on the holocaust, and to see to it that it will be passed on to the coming generations. From my point of view, there were also miracles in the holocaust, and the event of the train was one of these. Actually, the Americans could have left behind the train with its passengers, and continue their role of fighting in the war. Moreover, the train could have been target to direct shelling”. Within two months Varda managed to locate about 70 survivors, most of them in Israel. So far, a total of 140 survivors have been located. The meetings of survivors and rescuers at the High School continue, and the number of participants is increasing. “The students are very enthusiastic about these meetings”, says Rozell “From their point of view there is a tremendous difference between reading a history book and listening directly to people who were involved in the events. The students realize that they are the last generation having the chance of interviewing directly these people, so they take it as an obligation to see to it that the information will be brought to the coming generations.”. “Only for the last two years we have started knowing the people whom we have saved”, emphasizes Towers. “I feel proud and happy knowing that I have had a small part in saving them. They have come up from the ashes, like a Phoenix. It is amazing to see what they did with themselves. We have afforded them a second chance to live, and it warms my heart to see the results”.